A friend of mine from work and I went today to the crosses that line Memorial Drive here in Calgary. 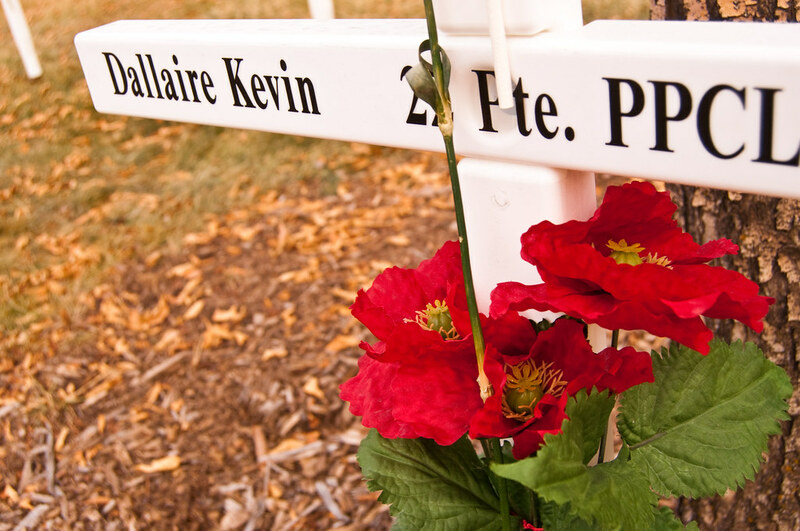 The 1500+ crosses were placed in recognition of the sacrifices Canadian soldiers have made in the wars. Each year more names are added partially because more soldiers are laid to rest but also because people come forth with information about friends and relatives they want to commemorate. Each of the crosses has a name on them along with the person's unit and what year they passed away. I was surprised at how many crosses were from World War I. I was also surprised that I remembered one man's name amongst all of the ones that I saw. On August 3rd, 2006 Pte. Kevin Dallaire was killed by a rocket propelled grenade while fighting with Taliban forces west of Kandahar in Afghanistan. Pte Dallaire served with the 1st Battalion of the Princess Patricia's Canadian Light Infantry. While my grandfather fought in World War II, I always think of the sacrifice that our soldiers have made in a very broad and faceless sense. But seeing Pte. Dallaire's cross today reminded me that it isn't some faceless soldier who died in a land far away from his home but a person with a family. A family who still feels his loss and feels that their son may have died in vain. The crosses are just that. These aren't graves. They're pieces of plastic covering steel stakes. But they still remind us of how a few set aside everything they held dear and everything they loved to put themselves in harm's way. So to those who serve and those who made the ultimate sacrifice I thank you. I won't forget you. Posted by Unknown at 12:02 a.m.